• Power Of Mind: Arizona Head Coach Jay Johnson utilizes every trick in the book to make his players better. 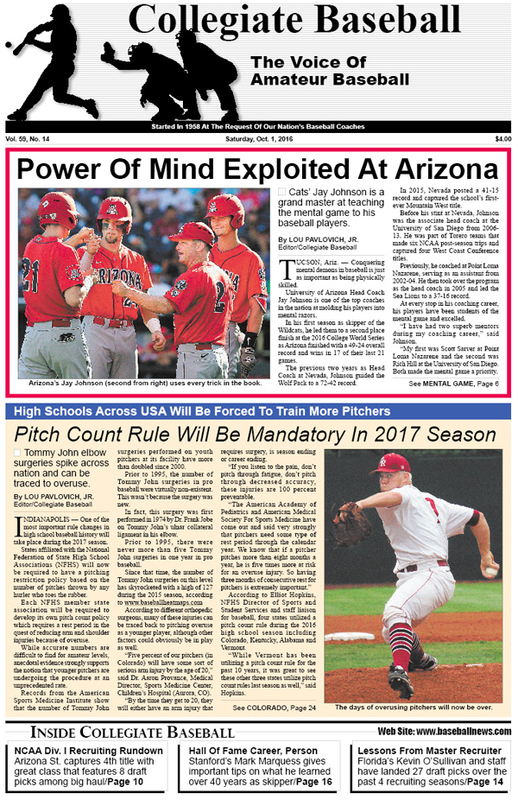 • Mandatory Pitch Counts In 2017 For High Schools: Four state associations utilize pitch counts during 2016 season with interesting results. • Past H.S. Pitching Rules Explored Across USA: From lenient to ultra strict, state associations have had interesting rules to protect the arms of pitchers. • NCAA Div. I Recruiting Results: Arizona State lands No. 1 class featuring 8 draft picks among big haul. • Stanford Skipper’s Amazing Career: Mark Marquess gives important tips on what he learned over 40 tears as a baseball coach. • Lessons From Master Recruiter: Florida’s Kevin O’Sullivan and staff have landed 27 draft picks over the past 4 recruiting seasons. • Lou Pavlovich: Practical jokes are special in baseball. • Upcoming Clinics: Superb instructional clinics scheduled across USA. • Book Reviews: Trio of amazing books (How 2 Focus: The Pitchers Zone, How 2 Focus: The Pitchers Zone and How 2 Focus: Like The Pros) sheds intense light on how the best players in Major League Baseball have been able to focus against the world’s best talent. • Rich Maloney: Upcoming ABCA Convention in Anaheim, Calif. will feature 25 world class instructional clinics. • Al Figone: Bob McClure once had the best pickoff move in all of baseball. • Ruleball With Rich Marazzi: Obstruction rules for baseball can take different avenues. • Ryan Brownlee: Managing time for players is crucial in college and can be helped with special Excel Spreadsheet. • Superb New Products: Here are an assortment of items that are designed to help baseball players. • Jerry Weinstein: When command vanishes, here is what you can do. • Charlie Greene: Cardinals’ pitchers’ fielding practice is exceptional. • USA Baseball: National teams active during summer of 2016. • Tom Kovic: Parents can play vital role in recruiting process. • Mike Epstein: Why doesn’t everyone copy swing of Barry Bonds? • Alex Gaynes: Not investing in muscle memory can hurt athletes severely. • Jack Dunn: Utilizing clock works like magic in scrimmages. To purchase the Oct. 1, 2016 edition of Collegiate Baseball or subscribe, CLICK HERE.